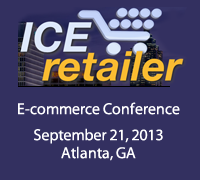 ReplyManager is giving away 2 free tickets to attend the e-commerce conference, ICE Retailer 2013 in Atlanta. Each winner will receive a One Full-Day Free Admission to ICE Retailer's general session on September 21, 2013. Enter Here for a Chance to Win. The E-Commerce Conference is a great opportunity to pick up new skills and best practices with 20+ speakers to help grow your business. It not only brings together top e-commerce entrepreneurs and industry experts, but provides a way to learn directly from them through roundtable sessions and plenty of networking opportunities. Enter for a chance to win free tickets. Be sure to LIKE ReplyManager or ICE Retailer on Facebook to see who wins! One entry per person, please. Winners will be randomly selected on July 26th.